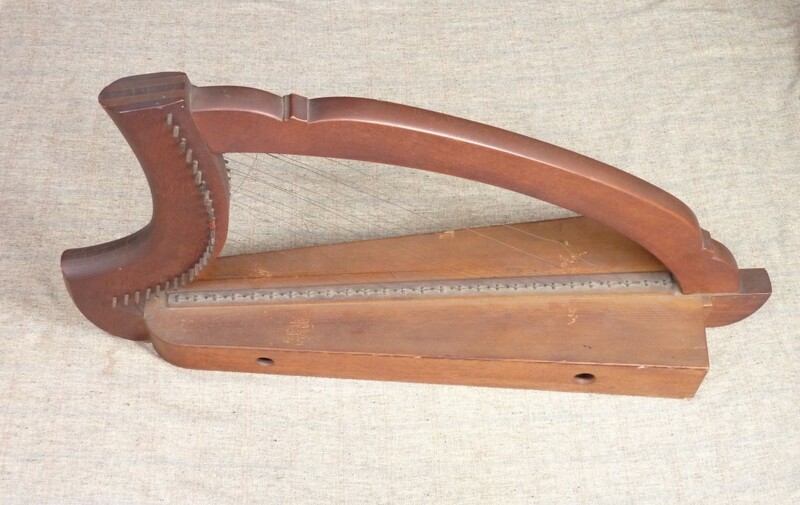 From the summer of 1932, she had the first clarsach replica manufactured by the Swiss musicologist Arnold Dolmetsch, based in Haslemere in Britain: made of cherry, with 27 metal strings. The harpist, the instrument and the melodies would charm the public (including Gildas Jaffrennou), when she toured Brittany in November of that year. The following year, she would be present at the Gorsedd of Quimperlé: on that occasion, Gildas Jaffrennou took measurements of that clarsach, and he made a copy in his workshop at Carhaix. In his words, this first instrument was not quite satisfactory – the first harp ended up being fed to the fire! (from conversations with Gildas Jaffrennou in July 1993 and 1997). 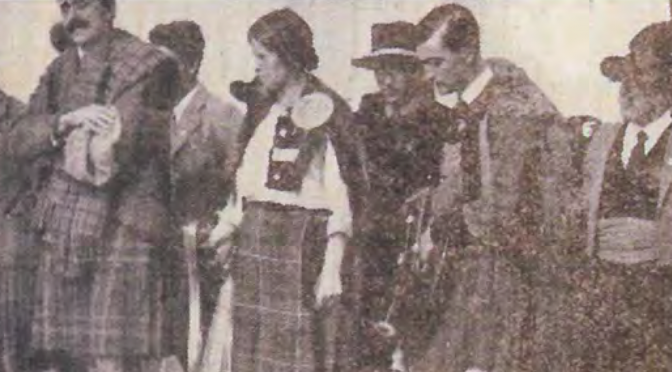 The photo at the top shows Heloise at Roscoff in 1934, with “Harplet”, her Clarke Irish harp. I have still yet to find a photo of her with the Dolmetsch clarsach. ‘I made one Clarsach among the others of a very fine piece of old wild cherry wood. It looks most beautiful, is lighter in weight than the others and has a deeper more velvety tone. I very much desire that you should have this one. I don’t know whether she accepted his offer. The notes beside the one photographed in the Mitchell state that it has the inscription, but is it really ‘the first’? Or is it their secret ‘first’? Well the wood grain in the Mitchel photo doesn’t look like cherry to me. But the inscription quoted says “July” with no year given. I wonder if the photo (taken by Morleys in London) shows the “first” first, while the inscription is the one added to the replacement? If only we could find her harp! I’m just discovering your articles concerning the history of the Dolmetsch harps and Heloise Russell-Fergusson; and good news about the book of this marvallous harpist : book i ‘ll buy on your site, as i already did in the past about books and recordings of Heloise and Mabel Dolmetsch. Concerning the book Telenn, la harpe bretonne, we are two authors : Alan Stivell and i; and your quotation about Heloise Russell-Fergusson, page 87, is mine, as all historic parts in the book (in blue in the book). I found all the informations at the Mitchell Library, Glasgow, of course, in different newspapers, the answer and informations from Helene Witcher to my letter, and discussing with Gildas Jaffrennou i met in july 1993 and 1997. The harp of Heloise at Roscoff in 1934, you right, was her Clarke Irish Harp : you will find a better view of her Harp, in the english version of the Pathé film made at this occasion. Always looking for historic news on “celtic” harps, the pleasure to read you.